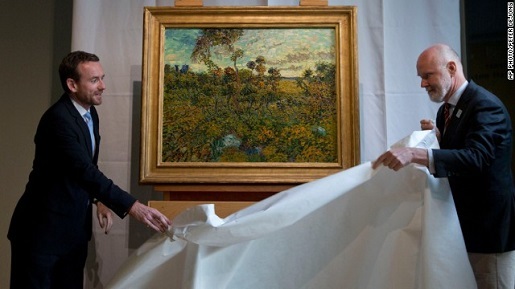 Van Gogh’s “Sunset at Montmajour” is unveiled at the Van Gogh Museum. The painting was apparently part of a collection owned by Theo Van Gogh, brother of Vincent, in about 1890 or so. It was sold in 1901, then disappeared for awhile until apparently being rediscovered in 1970 as part of a private collection. The unsigned painting was previously dismissed as a Van Gogh by the museum in the 1990’s, but a two-year process of investigation using modern techniques has apparently verified the painting as a legitimate part of Van Gogh’s surviving work. It was apparently mentioned in a letter from Vincent to Theo as having been done July 4, 1888.